Posted August 19, 2015 by admin & filed under Galva Auto Repair. When you’re thinking about purchasing a new (or new-used) vehicle, it is easy to focus on the new features, shiny paint, and dealer offers of a new vehicle. But is it really worth it to buy a new car? Let’s look at just one factor: Monthly payments. 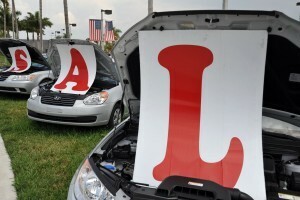 Buying a new car usually comes with a large loan, broken into monthly payments for years to come. If you already have paid off your vehicle, you’re monthly payment free for as long as the car is on the road! But you can’t forget maintenance costs. The cost of a new vehicle isn’t limited to the price tag or monthly payment. New cars (and used cars) will still have regular maintenance costs, including oil changes, alignments, and other preventative maintenance. When you’re looking at a quote for a large repair on an older vehicle, it’s easy to think that maintaining an older vehicle is more expensive than buying a new one. But most often, this isn’t the case. Even with older vehicles and large repairs, the cost of repairs and maintenance will almost certainly be less than payments on a new vehicle. When you factor in the cost of maintenance you’ll need to pay for your new vehicle, the difference is even more remarkable. Consider also dealer-only maintenance contracts that often come with new cars. If you’re required to take your new car to a dealership for routine maintenance to keep your warranty, you’ll end up spending much more than if you could take it to your trusted independent transmission shop. I’ve seen estimates that say people can save nearly $250,000 over a lifetime, just by keeping a vehicle for 10 years instead of 5. When you break down the difference between monthly payments and maintenance costs, it’s easy to see why. If you’re considering purchasing a new car or want advice on the transmission maintenance to keep your current car safe on the roads, stop by Nightingale Transmissions in Galva or call 620.654.3445.